Box suppers were a popular feature of many social gatherings at schools and churches in rural North Carolina. Girls often decorated boxes with ribbons and whatever colorful trim was at hand and filled them with such popular favorites as fried chicken, ham biscuits, cakes, and cookies. The boxes were then auctioned to the boys, who had been saving pennies for the event. A girl sometimes tipped off a special boy as to which box was hers and then waited, wondering, as the bidding went higher, whether her chosen recipient would be able to afford her box. The competition between boys occasionally led to physical combat. According to one account, the boxes that brought the highest price often belonged not to the most popular young ladies but to the daughters of prominent local citizens. The proceeds from the bidding were for the benefit of the church or school. At Yadkin College, for instance, the box supper was a regular part of commencement. Money collected from box suppers went to pay for medals awarded in the declamation contests. Beyond functioning as fund-raisers, box suppers also served as entertainment for the group and as a courting ritual for the young. Rhoda H. Wynn, ed., Paul Green's Wordbook: An Alphabet of Reminiscence (1990). "Many parents and young people from the school and nearby communities attend the pie and box supper, given by the school to raise money for additional repairs and supplies. 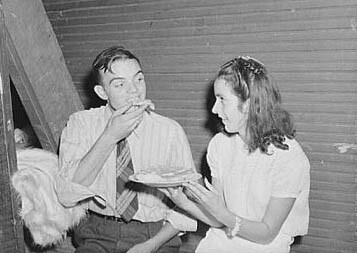 Each box or pie is auctioned off to the highest bidder, sometimes bringing a good deal, since the girl's "boyfriend" usually wins and has the privilege of eating it with her afterwards, Quicksand school, Breathitt County, Kentucky." 1944. Image courtesy Library of Congress, call #: LC-USF34- 055783-D [P&P] LOT 1464. Available from http://www.loc.gov/pictures/resource/fsa.8c13568/ (accessed August 2, 2012).